Take advantage of peach season! Fruit ice creams are super easy to make in a Vitamix—no ice cream maker required. Just blend frozen fruit and milk or cream. If you serve it right away, it will be a soft-serve consistency. If you prefer hard scoops, you can cool it in the freezer for a few hours. I experimented with the xanthan gum from my Frappuccino recipe to make it more scoopable after storing in the freezer. It worked great! Alternatively, if you don’t have xanthan and don’t want to eat the full batch immediately, you can portion out single servings when you put it away in the freezer to avoid having to scoop from a hard frozen block. I’ve found store-bought frozen peaches to be a bit mediocre, so for best results, get good fresh peaches. When they are fully ripe, slice, then freeze them in a single layer (I use cookie sheets). You want to avoid having a large frozen mass. This recipe does not use eggs, which makes it easier, since you don’t have to cook a custard. Plus, not having eggs allows the peach flavor to come through more clearly. Blend all ingredients except peaches on high for 10 seconds. 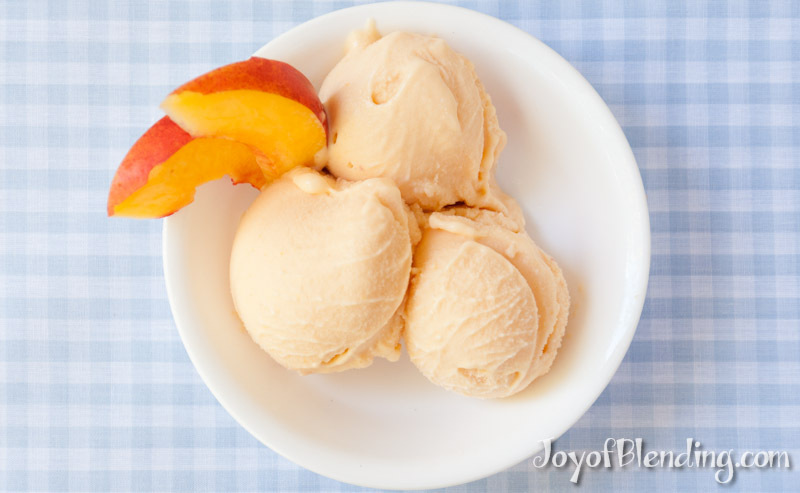 Add peaches and blend on high until ice cream starts circulating, then blend for another 5–10 seconds. You will need the tamper. Push ingredients in one corner all the way down, then make your way around to push down each of the other corners as well. The machine will make a deeper, louder noise than usual, and it may vibrate, but that is normal—don’t worry! You can substitute anything from milk to yogurt to cream for the liquid, depending on how rich you want it. For the sugar, you could use anywhere from none, up to 1 cup. The optimal amount will depend on your peaches and your palate. You can also use other fruit—strawberries are a classic. The ratio of 1 cup of liquid to 1 lb of frozen fruit (~3 cups pieces) should give you a good result every time. If you end up with something not frozen enough (either from over-blending, or things were not as cold as expected) you can salvage it immediately by adding more frozen fruit, or, in a pinch, ice. Or, you can freeze the mixture, then re-blend, as I’ve described in my nut and chocolate-based sorbet recipes. You can use coconut milk or nut milk. For an easy neutral option, you can make a thick and creamy cashew milk that does not need to be strained by blending ½ cup cashews plus enough water to fill to the 1 cup line—blend for at least a minute to get it fully smooth. You can include some ice cubes in the water if you want to use it right away, otherwise let it chill in the fridge, or freezer, before using (since blending liquid heats it). Aside from a smaller capacity, can the “S” series of Vitamix blenders do the same range of things as the larger new generation series? Yes, they can. I tested out the various things over on my S-Series review, and was surprised that they really could do all of them. (The only thing they can’t do is use the dry grains container, though they can still make some flours.) In fact, for recipes like this, the narrower S-Series containers allow you to make smaller batches—you could cut this recipe in half. Do you need to peel the peaches before slicing and freezing for the ice cream? No need to peel the peaches. I just realized that I should have been more clear. I’ve made it with and without peeling. I think it’s good both ways. If you don’t peel, there will be flecks of skin in the ice cream. The ice cream in the photo at the top used peeled peaches. Thanks Adam, I made the peach ice cream and it was delicious! I made this last night with my new Vitamin blender with the 32oz wet container. It made a full 32oz. I needed to add the peaches a 1/2 lb to start and then the remaining after initial blend in order to fit them in. I used heavy whipping cream as this is what I had on hand. I used fresh, frozen peach slices, unpeeled and 1/2 tsp Cardamom. Wow, what a rich creamy dessert! It had tiny flecks of peel which I think added to the appearance and flavor/texture. Next time I will make a half recipe as it is just my wife and I. The recipe as is easily makes (4) 8oz servings.